One of the biggest questions when it comes to college school supplies is what to do about textbooks. For most of us, we’ve never had to buy our own textbooks before and don’t know the do’s and don’ts. Luckily, after a year of figuring it out, I think I’ve compiled the best basics to textbook shopping! Do wait until syllabus week. Often your school will have a list ready of textbooks you’ll need for each class, but what I found out is that often the professors will change their minds and either not use a textbook at all, or use a different format of it (virtual, unbound, etc.). This could save you hundreds of dollars. One exception to this is if you get a class email from your professor saying he/she wants you to come prepared the first day! Don’t buy from the bookstore. Unfortunately most, if not all, college bookstores overprice their textbooks. Although it’s easy to just walk across campus to buy your books, you’ll be wasting lots of money, when you could’ve just bought them for way cheaper online! Do compare prices! Websites like SlugBooks, TextSurf, and BookScouter allow you to compare the prices of new and used textbooks from dozens of different websites. You’d be surprised how varied they can all be! Don’t ignore your personal learning strategies. I know I work better when I’m reading from a physical book rather than a computer screen. I like being able to mark on the pages and get away from technology. I realized this when I chose an online book rather than a physical book for one of my classes and completely struggled. Don’t make that same mistake. Do buy important textbooks, instead of renting. If you’re in classes pertaining to your major, you probably want to buy your textbook, rather than only owning it for a school year. You never know when, down the road, you’ll want to go back and review or look at something you learned in a certain class. Maybe you’ll even need it in grad school! Don’t share textbooks. Although this may sound like a cost-effective solution right now, it could hurt you down the road. There are so many scenarios where you need the textbook and your partner has it, and vice versa. It’s just a bad idea. Do pay attention to specifics. Many textbooks are updated yearly, or even twice a year. Your professor will probably specify which edition they want, and sometimes these can make a big difference in not only the price of the book, but the material as well! Don’t worry too much about the amount you just paid for your textbooks. At the end of the semester you’ll either get to return them, sell them back or sell them to classmates taking that class! 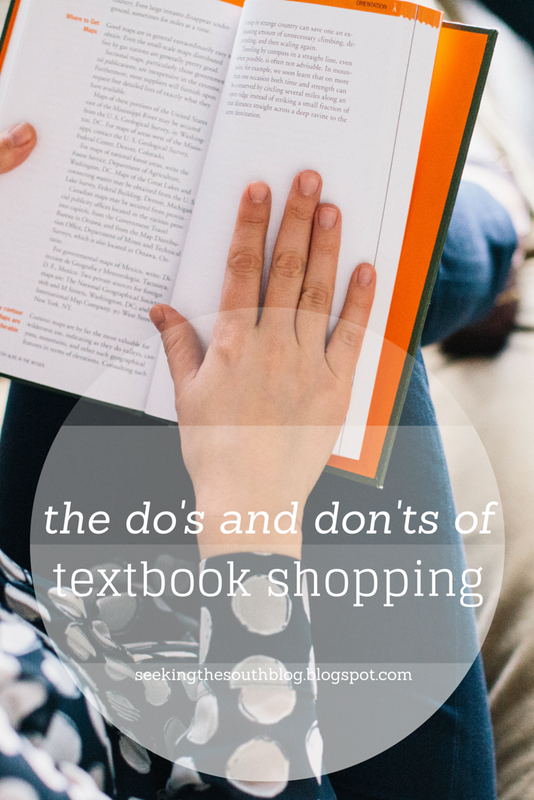 I hope these do’s and don’ts helped you out a little bit with your textbook shopping! I know it’s a stressful time trying to buy dorm decor, school supplies and recruitment outfits, but take a deep breath and just get excited for the days to come!